Recycled Concrete Available from 0"-5" unscreened to 0-5/8"@ $14.00 per ton and #2 screened concrete $18.00 and larger #3 or #4 @ $16.00 per ton . 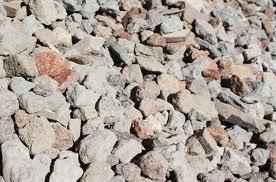 This Material is Used for Many Construction Projects in Place of a More Expensive Gravel or Limestone. We accept concrete waste at our dumping facility, including brick or block waste.